IMIHGOM is pleased to announce that Co-Founder and Director of Business Development Thomas Costelloe has been appointed Chief Operating Officer, a new position within IMIHGOM. As Director of Business Development, Thomas was responsible for business development of IMIHGOM and its client interactions, improving IMIHGOM’s position as a leading Business Development & Licensing company. Effective immediately, Thomas will assume responsibility for corporate and strategic development across IMIHGOM. IMIHGOM and Mimetas are jointly organising a symposium focused on ‘Emerging Technologies in Drug Discovery and Development’. The symposium will take place on Thursday, August 23rd on the Leiden BioScience Park. A panel of interesting speakers have been lined up, including Marco de Boer (NTrans Technologies); Tomas Bos (Glycostem); and Frank Beurskens (Genmab). Each speaker will address the scientific implications of their company’s technology in drug discovery and development programmes. In addition, two students will present their business development internships. Attendance is free, kindly register by sending an email to osmulders@imihgom.com. The closing day for registration is Tuesday August 21st. Walk-ins are welcome. Leiden, June 28th, 2018. IMIHGOM B.V., a European Business Development & Licensing company, announced today that IMIHGOM and Cyto-Barr B.V. will collaborate on the out-licensing of Cyto-Barr’s programmes for treatment of Epstein-Barr Virus (EBV) associated diseases and cancers. “We are delighted to partner with Cyto-Barr for the out-licensing of their innovative therapies targeting EBV-associated diseases. In particular, with EBV-associated cancers accounting for approximately 2% of all cancer-related deaths worldwide, there is a large unmet need for improved treatment options” said Mona Moghimi, Chief Executive Officer at IMIHGOM. “We look forward to working with IMIHGOM to find industrial partners to implement our innovative methods, our lead reagents and expertise to find a cure for Nasopharyngeal cancer (NPC), Posttransplant Lymphoproliferative Disease (PTLD) and other EBV-linked cancer types” said Prof. Jaap Middeldorp, Chief Executive Officer at Cyto-Barr. Established in 2016 in Leiden, The Netherlands, IMIHGOM B.V. is a European Business Development & Licensing (BD&L) company with in-depth scientific and business experience and excellent track record. We work closely with our scientific and business advisory boards, comprised of internationally recognized experts in the fields of science, medicine and business development. With a strong focus on oncology and neuroscience, IMIHGOM leverages this experience to support innovative companies operating in these spaces. For more information regarding IMIHGOM B.V. go to www.imihgom.com. Cyto-Barr is a Dutch biotech company specialized in diagnostic testing and treatment of diseases, specifically in association with EBV or cytomegalovirus (CMV). Cyto-Barr are global leaders in development of biomarkers for EBV diagnostics, with more than 40 partners worldwide in diagnostics and therapies for EBV and CMV. Cyto-Barr is developing innovative therapies targeting EBV in various EBV-associated cancer types and is involved in phase-I clinical studies for the treatment of nasopharyngeal carcinoma (NPC), which is endemic in certain parts of Asia and Indonesia. In the Netherlands a phase-I therapeutic study was recently started and in Indonesia we are preparing such clinical studies. We also actively pursue screening studies for the early identification of NPC, in order to improve treatment options. For more information, visit www.cyto-barr.com. IMIHGOM CEO Mona Moghimi will speak at the Business Development Program summer conference hosted by Ernst & Young in Amsterdam, The Netherlands on 25th and 26th September 2018. 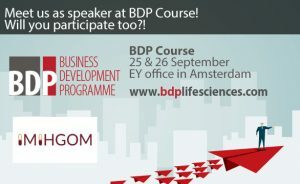 The BDP Course specifically aims at junior to mid-level BD professionals who are driven to expand their knowledge on the BD process and to strengthen their BD competences. Mona will join a panel of experts in sharing their experiences and insights in successful business development. Topics covered will includepartner search, valuation, negotiation, legal aspects, deal structures and finance. As part of the many exciting developments at IMIHGOM in recent months, we proudly launch our new website today. Our new website has been designed to improve your access to our company. Please take a moment to scroll through the various pages, where you can learn about our history, our goals, and our services. IMIHGOM has several other exciting updates and announcements planned in the coming months. Be sure to check back for updates, or subscribe to our newsletter to ensure that you do not miss out on any of our latest developments. If you are a life sciences entrepreneur looking for Business Development and Licensing support, drop us a line. IMIHGOM recently attended the SWISS HLG & PLCF Summer conference at Novartis in Basel, Switzerland. The topic of this meeting was ‘Innovation in Healthcare: From Technology to Business Models and Transactions’, and was jointly organised by the Swiss Healthcare Licensing Group (HLG) and the Pharma Licensing Club France (PLCF). Mona Moghimi joined 130 other participants to hear key success stories of innovative companies in Switzerland and France. In addition, key challenges were addressed, ranging from innovation, financing, and deal-making processes across immuno-oncology, digital health, and big data. IMIHGOM recently attended the Innovation for Health event in Rotterdam. Now in its fifth year, Innovation for Health is the premier event for key players in Health and Life Sciences in The Netherlands. Mona Moghimi and Thomas Costelloe joined other stakeholders in Health and Life Sciences to hear about latest developments, establish new contacts and catch up with old friends. Together, we aim to Shape the Future of healthcare! IMIHGOM is pleased to announce that Thomas Costelloe has joined the IMIHGOM team as Director Business Development. Building on the recent high growth of the company, IMIHGOM sees the addition of Thomas as an exciting opportunity to build towards a new phase of company growth. Thomas received his PhD from National University of Ireland, Galway and performed postdoctoral research in Ireland and the Netherlands. In addition, Thomas has extensive experience at the interface of science and business. Thomas will leverage his knowledge and experience to improve IMIHGOMs position as the leading Business Development & Licensing company in Europe. Welcome to the team Thomas! IMIHGOM recently attended the Dutch Life Sciences Conference (DLSC) at the Pivot Park in Oss. The DLSC is the foremost life sciences business network event in The Netherlands. Mona Moghimi joined over 450 life sciences companies in the Dutch Life Sciences sector in the 13th edition of the DLSC to hear about the latest developments, establish new contacts and catch up with old friends. Together, we aim to Shape the Future of healthcare! IMIHGOM recently attended the Pivot Oncology Conference in Oss. During this 5th year anniversary Pivot Oncology Conference, the audience learned from (inter)national renowned pioneers in the field of immuno-oncology of breakthroughs in precision medicine used for cancer treatment from both the scientific and business perspective.